The Corps of Royal Electrical and Mechanical Engineers (REME; pronounced phonetically as "Reemee" with stress on the first syllable) is a corps of the British Army. Soldiers and officers employed within the Royal Electrical and Mechanical Engineers (REME) are the technicians, mechanics and fabricators that consistently inspect, repair, modify and maintain the large array of equipment that the British Army has to offer. Wherever the British Army are, whatever the unit is, there you will find REME. As technologies advance and equipment becomes more complex, men and women of REME have to be up to the challenges of training and keeping up to date with modern engineering. Whether its maintaining the Apache Attack Helicopter, repairing a Multiple Launch Rocket System or recovering a Challenger tank, REME ensures that the equipment of the British Army is ready for action. World War II's increase in quantity and complexity of equipment exposed the flaws in this system. Pursuant to the recommendation of a committee William Beveridge chaired, the Corps of Royal Electrical and Mechanical Engineers was formed on the 1st October 1942. Those repairs which were carried out by unit tradesmen who were driver/mechanics or fitters in regiments and belonged to the unit rather than being attached to it. Repairs of RASC-operated vehicles, which remained the responsibility of the RASC; each RASC Transport Company had its own workshop. Repairs of RE specialist equipment, which remained the responsibility of the RE. The transfer to REME of most of the unit repair responsibilities of other arms (Infantry, Royal Artillery, Royal Armoured Corps etc.). The provision of Light Aid Detachments for certain units that had not possessed them under the old organisation. The provision of new REME workshops to carry out field repairs in RASC transport companies. Maintenance of vessels of the RASC fleet whilst in port was given to the fleet repair branch, a civilian organisation who came under the R.E.M.E umberela. This organisation was also responsible for arranging and overseeing ship refits. After some interim designs, the badge of the Corps was formalised in June 1943 for use as the cap-badge, collar-badge, and on the buttons. It consisted of an oval Royally Crowned laurel wreath; on the wreath were four small shields at the compass points, each shield bearing one of the letters of "REME". Within the wreath was a pair of calipers. 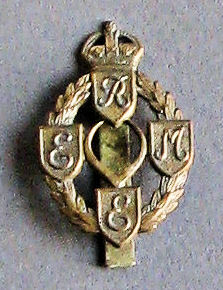 Examples of these early badges can be found at the REME Museum. In 1947 the Horse and Lightning was adopted as the cap badge. At the end of the war, the Allies occupied the major German industrial centres to decide their fate. The Volkswagen factory at Wolfsburg became part of the British Zone in June 1945 and No. 30 Workshop Control Unit, REME, assumed control in July. They operated under the overall direction of Colonel Michael McEvoy at Rhine Army Headquarters, Bad Oeynhausen. Uniquely, he had experience of the KdF Wagen in his pre-war career as a motor racing engineer. Whilst attending the Berlin Motor Show in 1939 he was able to test drive one. After visiting the Volkswagen factory he had the idea of trying to get Volkswagen back into production to provide light transport for the occupying forces. The British Army, Red Cross and essential German services were chronically short of light vehicles. If the factory could provide them, there would be no cost to the British taxpayer and the factory could be saved. To do this though, a good manager with technical experience would be needed. Maj. Ivan Hirst was told simply to “take charge of” the Volkswagen plant before arriving in August 1945. He had drains fixed and bomb craters filled in; land in front of the factory was given over to food production. At first, the wartime Kubelwagen was viewed as a suitable vehicle. However, once it became clear it could not be put back into production, the Volkswagen saloon or Kaefer (Beetle) was suggested. Hirst had an example delivered to Rhine Army headquarters where it was demonstrated by Colonel McEvoy. The positive reaction led to the Military Government placing an order for 20,000 Volkswagens in September 1945. REME Full Dress Home Service Helmet with Brunswick star cap badge. Both REME training battalions are due to relocate to Lyneham, Wiltshire during the autumn of 2015 as part of the Defence College of Technical Training (DCTT). In line with the Army 2020 review there are a total of seven Regular, two Training and six Army Reserve battalions within REME. 1 Close Support Battalion REME, based in Catterick, is a part of 102 Logistic Brigade, 1st (United Kingdom) Division. 2 Close Support Battalion REME, moving to Leuchars in Fife - Spring 2015, is a part of 102 Logistic Brigade, 1st (United Kingdom) Division. 3 Armoured Close Support Battalion REME, based in Germany, is a part of 101 Logistic Brigade supporting 20th Armoured Infantry Brigade within 3rd (United Kingdom) Division. 4 Armoured Close Support Battalion REME, based in Tidworth, is a part of 101 Logistic Brigade supporting 12th Armoured Infantry Brigade within 3rd (United Kingdom) Division. 5 Force Support Battalion REME, based in Ludgershall, is a part of 104 Logistic Brigade within Force Troops Command. 6 Armoured Close Support Battalion REME, based in Tidworth, is a part of 101 Logistic Brigade supporting 1st Armoured Infantry Brigade within 3rd (United Kingdom) Division. 7 Air Assault Battalion REME, based in Wattisham, is a part of 16 Air Assault Brigade. 10 Training Battalion REME, based in Bordon, provides trade training to regular soldiers as well as army reserve soldiers as Vehicle Mechanics, Armourers, Recovery Mechanics, Metalsmiths and Technical Support Specialists as well as conducting equipment courses. 11 Training Battalion REME, based in Arborfield, provides trade training to Aircraft Technicians, Avionics Technicians and Electronics Technicians. Both of these battalions are due to move to Lyneham, Wiltshire in the autumn of 2015 as part of the Defence College of Technical Training (DCTT). When merged they will be known as 8 Training Battalion REME. 101 Battalion REME, HQ based in Wrexham, with sub units in Prestatyn, West Bromich/Telford, Merseyside and Manchester. (Paired with 6 Armoured Close Support Battalion). 102 Battalion REME, HQ based in Newton Aycliffe with sub units in Newcastle, Scunthorpe/Hull and Rotherham/Sheffield. (Paired with 1 Close Support Battalion). 103 Battalion REME, HQ based in Crawley with sub units in Redhill, Ashford/Bexleyheath, Warley/Barnet and Portsmouth. (Paired with 4 Armoured Close Support Battalion). 104 Battalion REME, HQ based in Northampton with sub units in Swindon, Derby/Nottingham and Coventry/Redditch. (Paired with 5 Force Support Battalion). 105 Battalion REME, HQ based in Bristol with sub units in Bridgend/Cwmbran, Taunton/Yeovil and Gloucester. (Paired with 3 Armoured Close Support Battalion). 106 Battalion REME, HQ based in East Kilbride with sub units in Edinburgh, Grangemouth, Glasgow and Belfast. (Paired with 2 Close Support Battalion). The head of REME was officially known as Director of Electrical and Mechanical Engineering (Army) or DEME(A). In 2012 a new post of Master General REME was created to head the Corps of which Lt Gen Figgures became the first incumbent. ^ "Our history". Ministry of Defence. Retrieved 9 May 2014. ^ a b "Royal Electrical and Mechanical Engineers: A history". Retrieved 9 May 2014. ^ "The Aims of the REME Association". Retrieved 9 May 2014. ^ "SEME and Bordon Garrison". British Army. ^ "Maj Gen Sir Eric Bertram Rowcroft, CB, KBE, M.I. Mech.E., M.I.E.E. 1891 – 1963" (PDF). Retrieved 9 May 2014. ^ "Major-General Denis Redman". The Telegraph. 10 August 2009. Retrieved 19 December 2013. ^ "ATKINSON, Sir Leonard Henry (1910-1990), Major General". Liddell Hart Centre for Military Archives. King's College London. Retrieved 23 December 2013. Durie, W. "The British Garrison in Berlin 1945-1994, No where to go" Verlag: Vergangenheits, Berlin May 2012 ISBN 978-3-86408-068-5.